Following the great success of the first Roots of Fire project earlier this year, we are very pleased to announce Roots of Fire part II. This project supported by the Bagri Foundation and Arts Council England will see the creation of a new piece of music, a fusion of eastern and western musical traditions for sarod, tabla and orchestra. This piece will be jointly composed by master of sarod Amjad Ali Khan in collaboration with conductor David Murphy, and with musical material produced by children aged 10-11 in a large scale education project of school workshops across Luton, Slough and Leicester this autumn. Friday 10 November, 7:30pm: Luton Library Theatre. Saturday 11 November, 7:30pm: Curve at Slough. Monday 13 November, 7:30pm: Peepul Enterprise, Leicester. Amjad Ali Khan is one of the undisputed masters of the music world. Born to the illustrious Bangash lineage rooted in the Senia Bangash School of music, he is credited with reinventing the technique of playing the sarod. 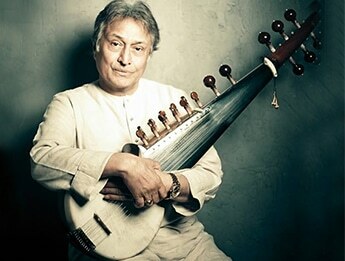 Over the course of a distinguished career spanning more than six decades, Amjad Ali Khan has won numerous accolades including a Grammy nomination, the Crystal Award by the World Economic Forum, Unicef’s National Ambassadorship and the Fukuoka Cultural grand prize. He has performed at venues the world over including Carnegie Hall and the Royal Albert Hall, as well as at the prestigious Nobel Peace Prize Concert in 2014 in Oslo, Norway. Samaagam, his first sarod concerto, has been performed by the Britten Sinfonia, Orchestre National d’lle de France, London Philharmonia, Gulbenkian Orchestra, Welsh National Opera and Scottish Chamber Orchestra.